It may be hot in your dorm room, but think about how hot it must be playing field hockey in this heat. Suddenly, sleeping in the Bennet lounge seems like a luxury none of us deserve. The field hockey team has pushed through this heat wave to start their season on a positive note and are hoping to carry this momentum through the regular season. The Red and Black struggled with a challenging schedule last year, finishing with a 1-9 conference record and landing in second to last place in the NESCAC rankings. Still, the team is optimistic that some new energy and returning talent will power them to the postseason. With a deep roster that includes 23 players and three goaltenders, the team will have a deep bench to help them throughout the season, whether or not it is 90 degrees. The classes of 2020 and 2021 are expected to make the greatest contributions to the team this fall. Sophomore Nikki Gerjarusak and juniors Erica Horowitz and Maddie Shea return to lead the offensive charge, while junior Rachel Pomerantz and sophomore Amy Schaap will hold down the defense. Delaney Wood ’20 will be back between the goal posts, as she is looking to remain one of the NESCAC’s top goalkeepers this season. In 2017, she made the most saves in the conference, and had the fifth best save percentage. Additionally, the team added 10 first years to their roster. These freshmen cover every position on the field from goalkeeper, to defender, to midfield, to forward, and will comfortably round out the roster as they make their first appearances on Smith Field. Coach Patti Klecha-Porter is leading the team for her 34th year and is looking to build on an already storied history with the program. Hopefully, Klecha-Porter will add on to her 206 total wins this fall and make her 14th appearance in the NESCAC tournament this October. 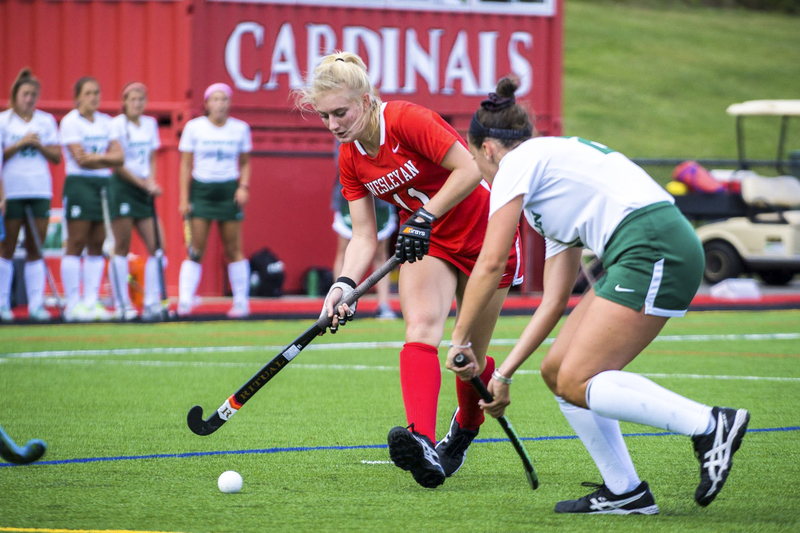 The Cardinals set out on a path towards success this past Wednesday at Eastern Connecticut State University where they played their season opener. The team flew away with a shutout victory thanks to impressive offensive production distributed between several players, a sign that the team is working towards their goals as outlined by Klecha-Porter. “The focus is on moving as a unit…creating a partnership, and developing opportunities to strengthen every situation,” Klecha-Porter said. As a result of this gameplan, Wes dominated the game from the beginning. Horowitz scored less than five minutes into the game off of a dish from Gerjarusak. Then, before the first half ended, Rachel Curran ’20 and Meghan Jain ’19 added two more goals to the team’s tally. Heading into half, the team had a comfortable 3-0 lead. The second half had an even faster start, as Colleen Carrigan ’22 scored the first goal of her collegiate career just over a minute in. At the 44:36 mark, Gerjarusak set up Horowitz for her second goal of the game to give the Cards a 5-0 lead, and Maddie Shea ’20 scored once more for Wes to give the team a 6-0 victory. Wood had little action during the 60 minutes she spent in goal, as she was only forced to make four saves. Caitlin Grant ’22 got to make her first appearance as a Cardinal between the pipes for the final 10 minutes but did not have to make any saves. The Wesleyan offense, however, was very busy. They combined to take 31 shots, forcing Eastern’s goalies to make a total of 23 saves. Ten different players took shots on goal, and five different players tallied assists to make the victory possible. Next, the Cardinals head to Massachusetts for a Saturday matinée against Babson College. The Beavers are already 3-0 on the season and having posted a 17-5 record last season to finish first in their conference, should be a challenging foe. The team will finally return to Middletown for their home opener against Roger Williams University. The Redbirds beat Roger Williams to start off their 2017 campaign and will look to repeat their victory next Tuesday night at 5 p.m. on Smith Field.